Matthew Paris (c. 1200-1259) became a monk of St. Albans in 1217, and in 1236 became the abbey chronicler, a task which allowed him to exercise and explore his talents as a scribe, and as an accomplished and inventive artist. Most of this manuscript is written in Matthew's own distinctive handwriting, as are the miniatures, except for some added in the 14th century. Known by Matthew as his 'Book of Additions', it contains a variety of miscellaneous texts and images. 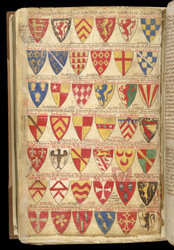 Among Matthew's many other interests was heraldry. Here he has laid out in rows copies of the shields of members of the English nobility. That in the top left corner, the three gold leopards on a red ground, were the arms of the king.